An activity I’ve been interested in for a number of years, but have sadly never gotten very knowledgeable about, is “crunching”: volunteering the idle time of my computers for scientific computing. This is achieved through the Berkley Open Infrastructure for Network Computing (BOINC), a piece of software that drives grid computing (i.e. a collection of computer resources from multiple locations to reach a common goal). I first became aware of the project many years ago (around 2000) when the Search for Extraterrestrial Intelligence (SETI) project (SETI@home) allowed users from around the world to connect to their servers to download and analyze radio telescope data. I mean, honestly, who wouldn’t want to help contribute to possibly finding E.T.? Since then, the community has grown into almost 4 million registered users volunteering processing power on around 70 different projects focused in the areas of mathematics, astronomy, biology, medicine, climatology, game theory, and other scientific pursuits. As users complete various tasks for each project, they’re awarded “credits” to show their contribution to the community. 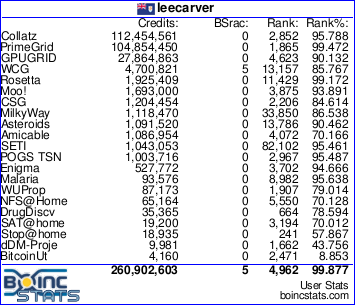 At present, I’m working on nine different projects and rank 45,229th in the world (woo-hoo!, I know) for cumulative credits. I’m trying to learn how to setup my computer to optimally operate with BOINC when I’m not using my system, which sometimes depends entirely on the project(s) you are running. Some projects require the use of graphics cards while others operate primarily off of the CPU. Regardless, participating in these projects has certainly caused me to look at the strains my system is put under and I’ve had to add a more robust cooling element for my processor to help it endure the strain it is put under. If you’re interested in scientific research and not already a part of the BOINC community, I encourage you to look at participating. Find a project that interests you, learn more about what research the group is doing and why, and then donate some of your computer’s processing power to the cause. It doesn’t cost you anything but a negligible increase to your utility bill. In the end, you could help wipe out malaria in Africa, study the effects of climate change, or find the cure for cancer.